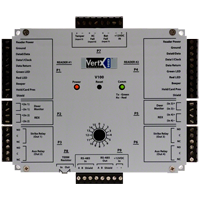 The HID VertX™ Products provide a complete and fully features hardware/firmware intrastructure for access control software host systems. The V100 Door / Reader Interface conects two access control card readers via Wiegand or Clock-and-Data interface controlling either one or two doors. The V100 features on-board flash memory, allowing program updates to be downloaded via the network. The V100 connects t0 V1000 through a high speed RS-485 network. The V1000, in turn, communicates with the system host via industry standard TCP/IP protocol over 10/100 Mbps Ethernet or the internet. This architecture minimizes the impact on corporate LANs by using only on TCP/IP address for every 32 interfaces and by handling low-level transactions on the RS-485 network. Processes off-line access control decisions based on facility code. Output Cirbuits: 500 feet (150 m), 2-conductor, usingALPHA 1172C (22AWG) or Alpha 1897C (18AWG) Minimum wire gauge depends on cable length and current requirements.